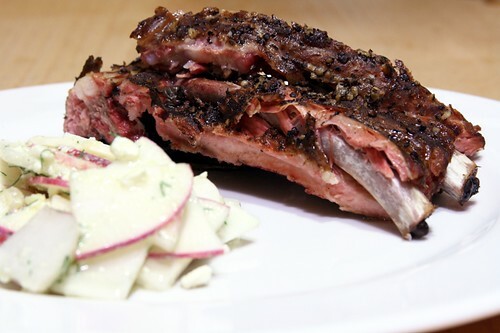 smoked and ginger beer-steamed spare ribs with fresh turnip salad, originally uploaded by aarn! +21st October, 2009+. tossed a medium-sized rack of spare ribs (lionette's market), which had been rubbed with salt and pepper, in the main chamber on the offset-smoker. stoked a two-tier fire, consisting of a layer of charcoal briquettes (fired about half-way in a chimney starter) topped with a layer of oak (tongue-and-groove wainscoting!! taken from vadim's backyard), in the fire-box. smoked at 200 to 250-degrees for about an hour, then transferred the ribs to a 1-in sheet pan equipped with a baking rack. filled the bottom of the sheet pan with saranac ginger beer, covered the whole pan with aluminum foil, and let bake at 225-degrees for 3-hrs (there was a water bath in the bottom of the oven as well, probably unnecessary). mixed together crushed garlic, a splash of apple cider vinegar, dry mustard powder, yellow mustard, salt and pepper, some fennel greens, and some diced feta cheese, and then drizzled in some canola oil until at the desired consistency. dressed some thin slices of raw turnip with this mixture, plated with the ribs.